In 1874 a group of artists, calling themselves "Société Anonyme des Artistes, Peintres, Sculpteurs, Graveurs,"—roughly "Artists, Painters, Sculptors, Engravers, Inc."—opened an exhibition independent of the official Salon. Conspicuously absent was Edouard Manet, recognized leader of the avant-garde. Though he never participated in any of their eight exhibitions, Manet's bold style and modern subjects inspired these younger artists, who came to be known as impressionists. The name is usually attributed to a disparaging critic who seized on the title of Claude Monet's Impression, Sunrise. Accustomed to the more polished works of the Salon, the critic compared—unfavorably—Monet's sketchy harbor view to wallpaper. He expected more of a painting than a mere "impression." But what had Monet meant when he used the word? Though he would say later that he had called his painting an impression because it "could not pass for a view of Le Havre," the word was already in common use to describe rapidly executed sketches and the visual impact a scene first made on an artist. Another commentator on the 1874 exhibition noted, "They are impressionists in the sense that they render, not the landscape, but the sensation produced by the landscape. . . . " Artists like Monet, he realized, wanted to paint not simply what they saw but the way they saw it. "Impressionism" entered the lexicon of painting at a time when French positivist philosophers and scientists were studying perception and color theory. 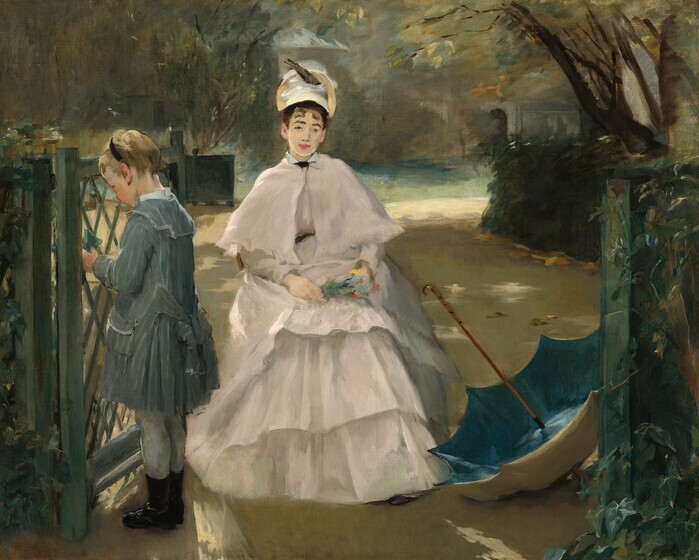 Artists accepted on principle that Manet's style, which juxtaposed discrete brushstrokes of color rather than blending them, most perfectly transcribed their raw sensation. The impressionists used color, not modeling from dark to light, to create form, recording with quick brushwork a fleeting effect of changing seasons, weather, and times of day. 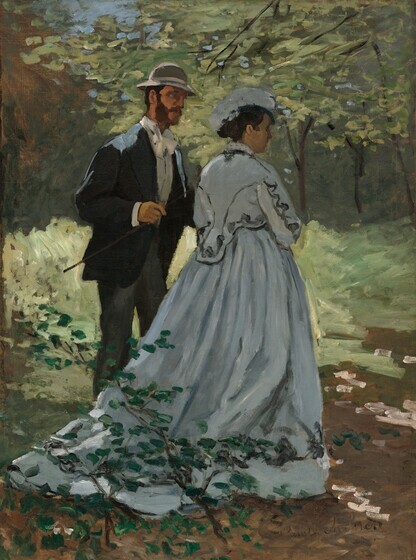 While the impressionists were preparing for their first exhibition, Manet was completing his submissions to the 1874 Salon, which included this painting. Only the iron fences and steam billowing from an unseen locomotive locate these enigmatic figures, but it would have been enough for contemporary audiences to understand that they are on the ambitious new iron bridge that crossed the rail yard of the Gare Saint-Lazare. Departure point for excursions to popular recreation spots like Chatou and Argenteuil, it was the busiest train station in Paris. Viewers at the Salon, however, were disturbed by Manet's title The Railway. They had trouble matching it to his subject—itself very hard to decipher. The woman and girl are a study in opposites: one facing us, the other turned away, their garments antipodes of blue and white. The woman, so close to the front of the picture plane, seems to engage us. Her expression, though, provides no hint of her story, only detachment and ambiguity. 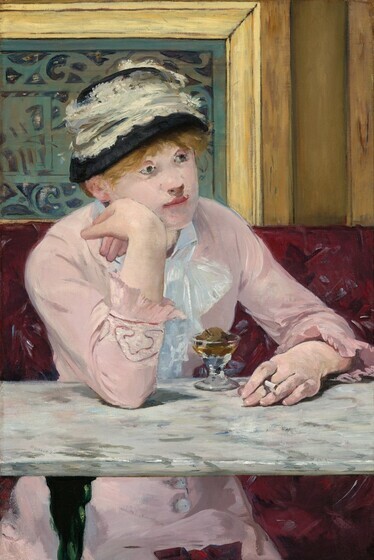 It did not help that for many contemporaries, Manet's style—with its flat broad areas of color juxtaposed without transitional tones—appeared unfinished. What is the situation of this young woman? Her cigarette suggests a certain impropriety—perhaps she is a prostitute waiting for a customer. Or, more likely, given her modest dress, she is only a shopgirl hoping for company. Manet's composition underscores her isolation. Our vantage point is close, as if we stand above her, but she is blind to our presence, lost in a pensive mood. The hard marble table acts as a bar between us. And her head is set off, framed by the grille behind her. The grille suggests that the setting may be the Café de la Nouvelle-Athènes where Manet gathered often with other members of the avant-garde, including writer Emile Zola and younger painters like Monet and Renoir. It was Zola who drew attention to what is often called the "painted patch" style of Manet's work. Writing in 1867, he described it as "an ensemble of delicate, accurate taches ('touches' or 'patches') which, from a few steps back, give a striking relief to the picture." Notice how individual dabs of color create the plum in its glass and the fingers of the woman's left hand. These broad strokes, accepted by many younger artists as a badge of modernity, could only have been made with the sort of flat-tipped brushes familiar today—and these first became available in the nineteenth century. Eva Gonzalès was the only formal pupil Manet ever had—he was notoriously ill-disposed toward taking on students. 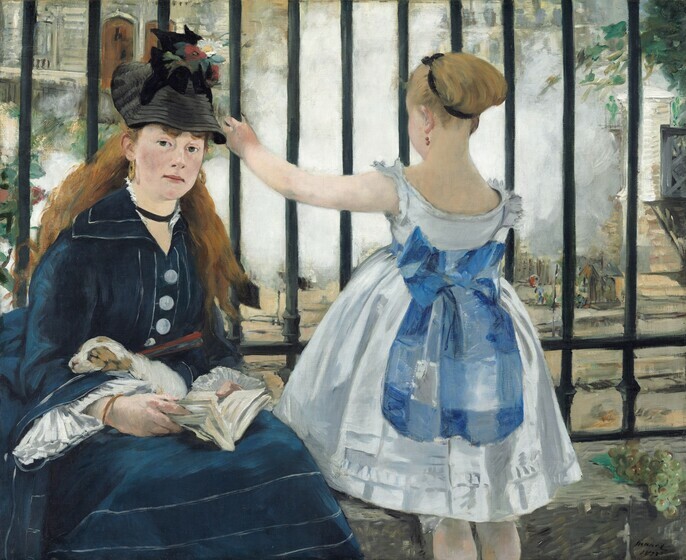 Her painting of a nanny and her young charge—the first facing the viewer, the second turned toward a barred gate—is an unmistakable homage to Manet's The Railway. Her brushwork is similarly broad and energetic; it eliminates transitional tones and detail. Nevertheless, Gonzalès' painting feels different. Its open airiness contrasts with The Railway's restricted and compressed space. Gonzalès was part of the impressionist circle in Paris, one of only four women generally associated with the group. She shared their interest in depicting modern life, although, like Manet, she did not join in the impressionists' exhibitions. This painting was shown at the Salon of 1878 and is perhaps her most accomplished work. Like contemporaries Mary Cassatt and Berthe Morisot, Gonzalès most often painted scenes from within her own social milieu. Her family was a distinguished one. Her father was a well-known writer and her mother a musician, both of whom fostered her interest in the arts. This canvas was probably made in Dieppe, in Normandy. As the closest seaside resort to Paris, with a promenade, pebble beach, and casino, Dieppe was popular with well-to-do tourists who came for the season. The English nanny (Gonzalès' original title was Miss et bébé) is a sure mark of upper-class status. Although he is best known for his figures, especially nudes, Renoir's originality as a landscape painter was instrumental in the formation of impressionism. In paintings like this he transcribed the immediate and fleeting effects of light on the senses. We almost squint at these backlit forms. Figures are defined by a few quick strokes, and incidental details disappear in the glare of bright sun. The pavement is yellow with this light, brighter even than the sun-drenched sky. Shadows fall, not black or gray but in cool blue tones. Among the energetic crowd crossing the Pont Neuf, Paris the oldest bridge in Paris, one man appears twice. Sporting a straw boater and carrying the boulevardier's cane, this is Renoir's brother Edmond, dispatched by the artist to delay people on the street. Edmond later explained that while passersby paused to answer his idle questions, Renoir was able to capture their appearance from this window above a nearby Right Bank café. Rowing was the foremost attraction at Chatou, while only a few kilometers upstream Argenteuil's more reliable winds attracted sailors. Here a man brings a pleasure gig to shore. These two-person boats were designed for more relaxed recreation than the sculls we see in the distance. The rower sat facing his companion, who controlled the rudder by means of ropes. The man in this gig—wearing the boater's typical costume of short jacket and straw hat—may be the artist's brother Edmond. The man standing on the bank, similarly attired, is probably the painter Gustave Caillebotte, a devoted rowing enthusiast. The woman may be Aline Charigot, who became Renoir's wife and was a favorite model. The painting captures the brilliance of sun and water, summer and youth. In the water, skips of strong blues and white alternate. Their shimmering intensity is enhanced by the equally strong presence of orange in the boat's reflection and the scarlet accent of Aline's bow. Renoir has put into practice aspects of current color theory. The principle of simultaneous contrast suggested that colors were perceived more strongly when juxtaposed with their opposites—orange with blue, for example, or green with red. 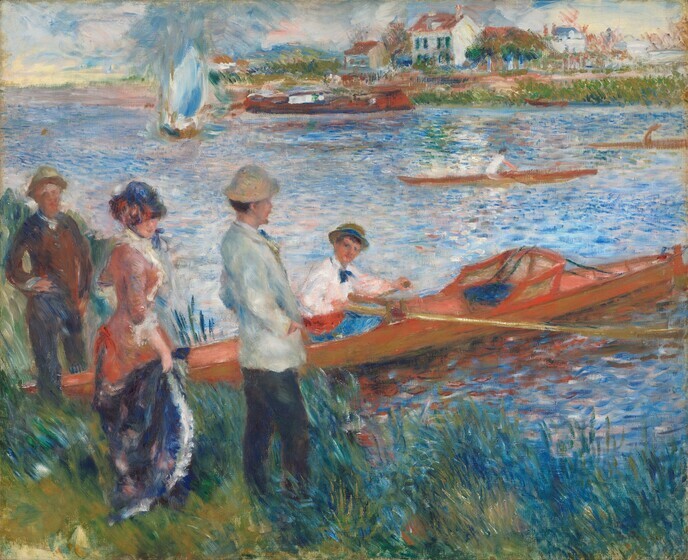 The silky texture of Renoir's feathery brushstrokes mirrors the languid and leisurely scenes. An elegant young couple steps into a sunlit clearing from the cool of the Fontainebleau forest. Brightness dances off their clothes, creating the strong highlights that define the curve of the man’s hat and catch the bunched hem of the woman's dress. Shadows fall, not in blacks or grays, but as deeper concentrations of the colors around them. Monet was one of the young artists who frequented the Café Guerbois, where Manet and other members of the avant-garde discussed art and literature. Monet championed painting out-of-doors—en plein air—as the only way to capture the sensory experience of light and atmosphere. He sought to transcribe a single instant onto the canvas, and here that momentary quality is enhanced by the pose of the couple, who seem only to have paused. Monet knew the pair. The man is his friend and fellow painter Frédéric Bazille, described by novelist Emile Zola as we see him: "Blond, tall and thin, very distinguished." 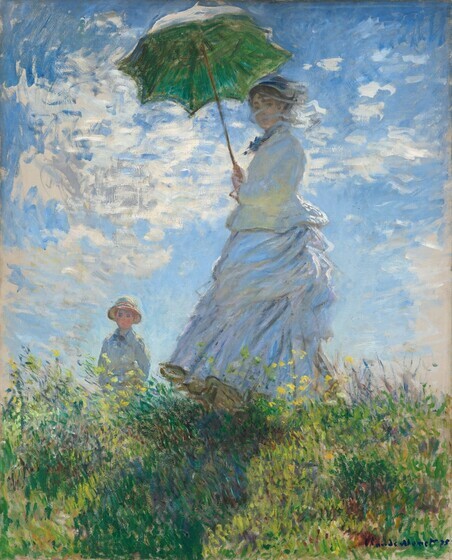 The woman may be Monet's mistress Camille, whom he would eventually marry. This painting was made as an oil sketch for a much larger work (15 x 20 feet) whose size made painting outdoors impossible. 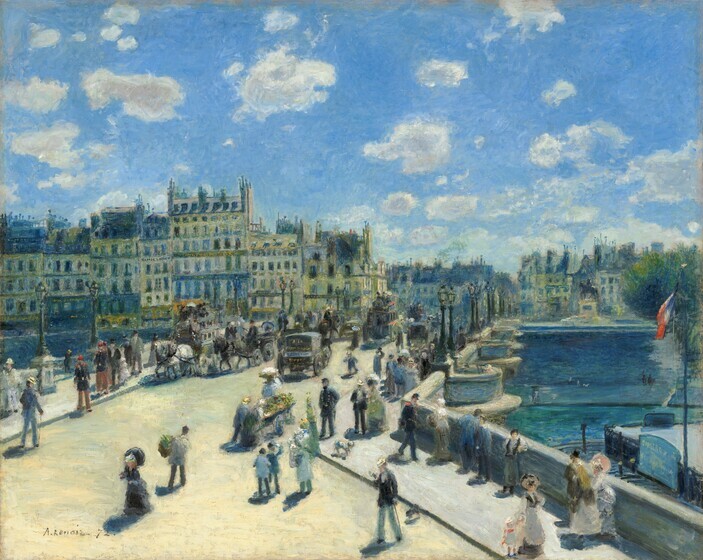 Instead Monet made smaller preparatory paintings out-of-doors, including this one. Only fragments of the final large canvas survive. 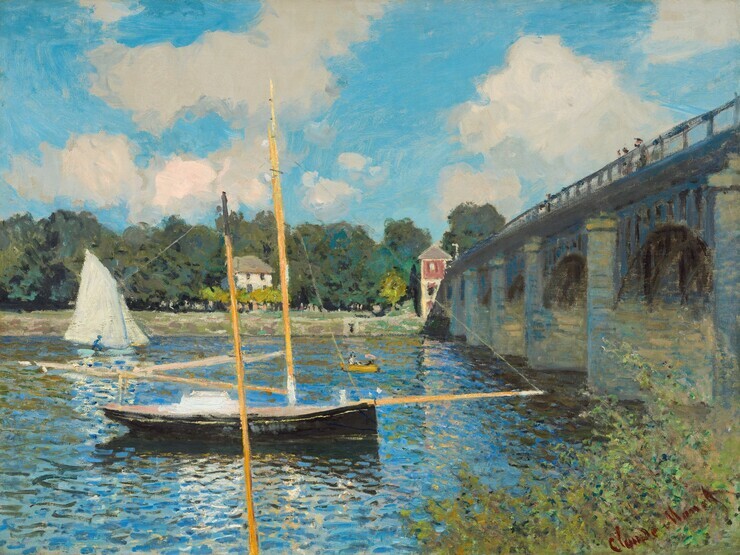 Monet left it with a landlord to cover a debt, and it was ruined by moisture and neglect. In the early years of impressionism, Monet, Renoir, and others strove to capture the fleeting effects of light and atmosphere on the landscape and to transcribe directly and quickly their sensory experience of it. Monet advised the American artist Lilla Cabot Perry, "When you go out to paint, try to forget what objects you have before you, a tree, a house, a field or whatever. Merely think here is a little square of blue, here an oblong of pink, here a streak of yellow, and paint it just as it looks to you, the exact color and shape, until it gives your own naïve impression of the scene before you." Monet planted gardens wherever he lived. When he rented this house at Vétheuil, he made arrangements with the owner to landscape the terraces, which lead down to the Seine. The boy with the wagon is Monet's young son, and on the steps behind him are other members of his extended household. On the path, the brilliant sunlight is dappled with shade that falls in blues, plums, and various greens. Figures and faces are defined—briefly—with color. 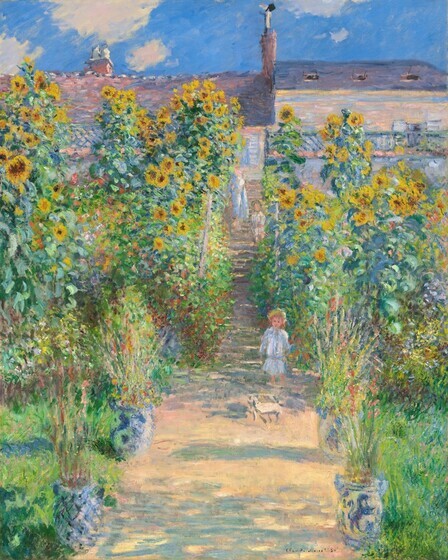 The large flowerpots were Monet's, and he took them with him each time he moved, using them in other gardens. They are "blue and white" only in our understanding: examined up close they are blue and green where they reflect the grass behind them, elsewhere tinged with gold or pink. By the early 1880s, when this work was painted, Monet had become increasingly interested in the painted surface itself and less concerned with capturing a spontaneous effect of light and atmosphere. The very composition of this painting, with its high horizon, traps our eye in the canvas—even the path is blocked in the distance by the rising steps. We are forced back to the surface, where the paint is textured and heavily layered. At close range, these brushstrokes, though still inspired by nature, seem less descriptive than decorative.